Like most of my fellow editors, my job at Macworld is multi-faceted: writing, editing, troubleshooting, tinkering, and—in my case—helping our crack features team put together Superguides, our line of how-to books and guides. Over the last year or so, as we’ve shifted away from the traditional print-and-CD model and more toward ebooks, we’ve increasingly focused on producing quality digital work for the iBookstore and Kindle store; unfortunately, it's not been easy. Our workflow is our biggest roadblock: It takes six programs to build a Macworld Superguide (BBEdit, Pages, InDesign, Calibre, Sigil, and iTunes Producer). And while the end result looks OK, the process is clunky, time-wasting, and full of unnecessary duplication. So you might understand why we might be excited by the rumor that an Apple-branded ePub publishing client may be announced at Thursday’s Apple press event in New York. Because if there’s one thing you can say for Apple, the company knows how to take complicated, fussy processes and reduce them to something elegant—often even beautiful. And right now, ebook publishing is anything but. If you want to put together a simple text-only ebook, there are applications that make it relatively straightforward—Storyist and Scrivener, to name a few—but once you get into anything with images, or tables, you’re dealing with a whole different beast. And, when it comes to something like digital textbooks—or detailed technology how-to guides—images and tables are a must. I’ve wished publicly in the past for a one-stop ePub publishing shop; if Apple does release such a tool on Thursday, here are some of the features I hope it might have. 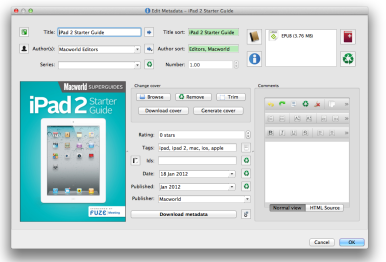 Export away: Pages offers limited export options for ePubs. Ebook software is an export game: Whether you're working in InDesign, Pages, Scrivener, or any other piece of content creation software, you can't work on an ePub directly—you make your file, then export it and hope for the best. If you need to change it after the fact, you either must re-export it, or edit it at the code level in a program like Sigil. Say I’m making an ePub for a picture book in Pages. I line up my pictures and my text the way I want it, then export the ePub. But since Pages can’t make fixed-format ePubs or break pages, I have to dive into the XHTML using a program like Sigil to make changes. And what if I want to tweak the book’s CSS? Sigil saves the day again. While technically capable, Sigil lacks a lot of the finesse publishers need to create captivating books. Its WYSIWYG “Book View” is buggy, and adding images or styling can be much more difficult than it should be. As a result, if I want to return to the comfort of Pages for any major edits, I would have to re-export the ePub and recreate every code alteration I’d made to that first ePub. 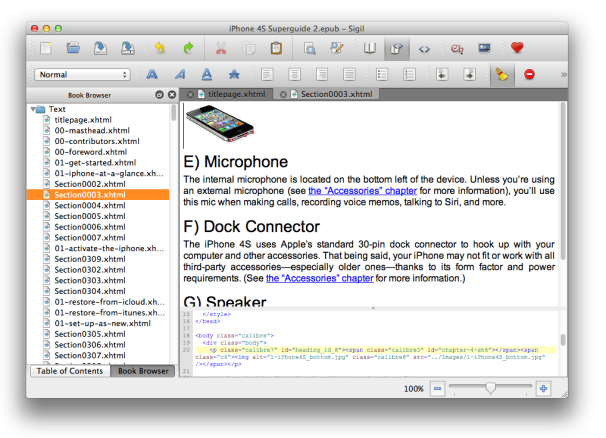 WYSWygged out: Open-source app Sigil has a basic WYSIWYG editor, but it lacks tools most publishers need. When it comes to websites, I’ve long been stubborn about working with code, rather than WYSIWYG (What You See Is What You Get) applications like Adobe’s Dreamweaver software. But this kind of interface—allowing you to see both what the reader sees and the underlying code—is absolutely essential for making beautiful books. If you can design an ebook from start to finish without needing to first mock it up and export it from another program, you’ve just made it that much simpler for publishers. Along those lines, it might be also nice to include features typically found in word processing software—track changes, for instance, and comments. “But, Serenity. You just said that you don’t want to import files.” True. I’d prefer to do all my work in one program; some publishers, however, don’t have that luxury. Textbook creators, for example, are most likely still going to have to put out a print version of their book for some time to come. 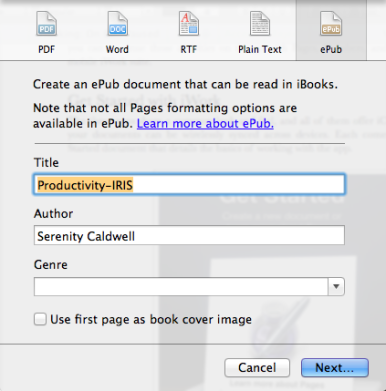 As a result, unless Apple plans to include InDesign-like functionality in its ebook software, the company would be smart to offer “Import from…” options for popular publishing applications. Messing with metadata: If you don't want to dive into an OPF manifest, you can edit metadata using Calibre. Publishers, by and large, don’t want to have to dive into code—and they certainly don’t want to have to fuss with an ePub’s OPF manifest, a code document which contains references and metadata for the book. Kovid Goyal’s Calibre currently lets users edit ePub metadata without diving into code, but to do so you may have to reprocess your book—and recode it entirely to Calibre’s liking. Instead, it would be nice to be able to edit complex metadata and assign a cover image within just one application—no re-exporting necessary. If Apple’s going to make a tool for publishers that allows easy ebook creation, it seems only natural to be able to upload that ePub to the company’s iBookstore. Currently, uploading involves an Apple development tool called iTunes Producer, which, while functional, has its fair share of oddities and frustrations. 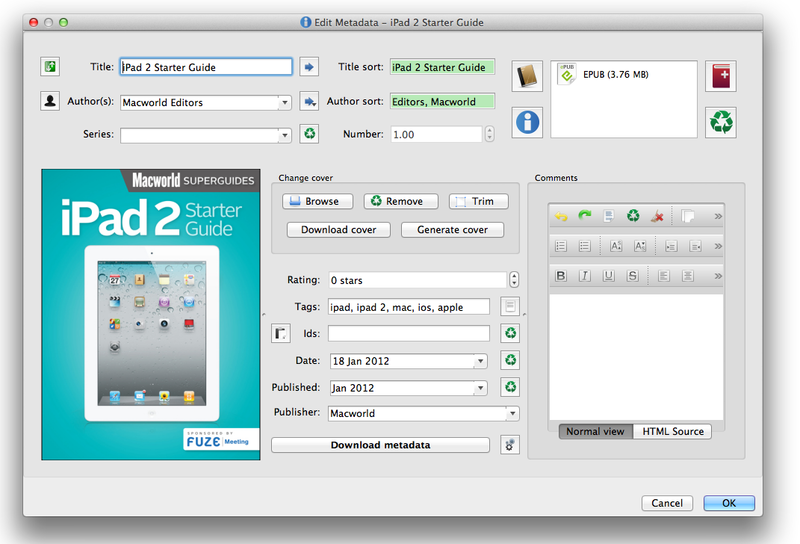 Plenty of Apple applications have built-in uploaders to websites like YouTube and Vimeo—why wouldn’t an Apple-branded book creation tool have a direct connection to the iBookstore? The one hitch in all this is that currently, to publish on the iBookstore, you need an ISBN for each book—easy enough for big publishers, but not so nice for independent writers trying to get their work distributed online. Amazon currently allows independents to publish online-only books without an ISBN; it’ll be interesting to see whether Apple decides to lower the barrier for iBookstore entry and do the same. Selfishly, I’d just like to be able to read an ePub on my Mac without having to use Sigil or Calibre. But in all seriousness, I think that if Apple’s serious about getting students to use digital textbooks, its iBooks app must expand outward to platforms beyond iOS. Plenty of students own an iOS device, sure—but there are many more who still treasure their Macs or PCs for scholastic use. Even if Apple releases the best new publishing platform in years on Thursday, the company will be limited in its results if students can only opt-in by purchasing an iOS device. That said, I’m betting that Apple will expand iBooks’s reach, even if it only starts with the Mac. The company has precedent with the iTunes Store, and an iBooks expansion would make Apple's product more competitive with its major rival, Amazon, whose Kindle Store is available for users with Kindles, iOS devices, Androids, Macs, and PCs.